A rent-to-own home is actually one of the best alternatives to owning a home if your credit rating is suffering. Before you actually buy the home you'll get to move in and pay rent for a lease period. During the lease period you are afforded the time you need to build up your credit score. There are several steps to take to increase your credit rating, which we'll discuss in this article. Really, there's no downside to improving your credit. Not only does a better credit rating qualify you for lower interest rates it can mean you have more leeway when negotiating deals with lenders. To start, you should check with each of the three major credit reporting agencies and go over your credit reports. Those agencies are Experian, Equifax, and Trans Union and all of them offer you a free credit report once per year. Examine the reports for anything that doesn't look correct. Once you've identified any discrepancies on the reports you should report those discrepancies to the corresponding credit reporting agency and ask them to remove the item from the report. If the item is removed, it can give your credit a significant boost. The next step you will want to take is to setup a budget. A significant portion of people with poor credit are in that situation because of poor budgeting. Take some time to sit down and go over your income vs your expenses. When you apply for a loan later on to purchase the home you are renting, the lender will want to look at your debt to income ratio, otherwise known as a DTI. This is the portion of your income that goes to recurring debts. Ideally your DTI should not exceed 30%. Keep in mind that a lot of your regular expenses are not counted as debts. For instance, your groceries and your gasoline are things you purchase on a regular basis but they aren't considered debts and as such do not count towards your DTI. Things that do count as debts include; utility bills, rent, car payments, college loans, etc.. Be sure cancel or downgrade services that you don't really need or often enough to justify the expense. There are lot of different credit cards out there that offer different rewards, with different fees. You should take some time and do some research before choosing which card is best for you. Nerdwallet is a great site to use for credit card research and reviews. In our opinion, you should pick a card that best aligns with your lifestyle. If you find yourself purchasing gasoline quite often, then you might want to get a card that gives free gasoline as a kickback or gives you cash back when you purchase gas. There are also cards that work much the same way for groceries and there even more which work for a combination of purchases. A credit card can be the absolute best utility you can use to build your credit. If used responsibly it is not uncommon to see a credit score jump up from a poor to an excellent rating is just a year. Using the card responsibly means that you only use the card to purchase the things that you would purchase anyway, then you pay off the card before you incur interest. The key is to look at the credit card as a tool for building credit and not as a loan or as a source of emergency money. These are the steps you can take to build your credit and qualify for a loan while you're leasing a rent-to-own home. 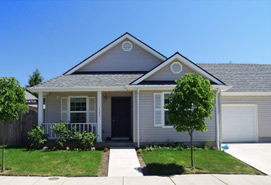 And while you are here take a look at our rent-to-own home listings in your area.